Today, let's welcome Chris from WildmooBooks . She is here to share with us some of her thoughts for this Mental Health Month. Like most people who’ll find this post on Book Bloggers International, I’ve always turned to books to learn about issues and new interests that develop in my life. The first nonfiction book I checked out of the library was one about hamsters. I was perhaps 3 or 4, not yet in school, and was stunned to learn that there were these tiny, kid-sized furry creatures that people kept as pets. It would be a few years before my parents allowed me to have one, but once a hamster came into my life, you can bet more hamster books were part of the experience. In the later years of my grade school experience, while twirling the dial on my portable radio/cassette player, I came across the storytelling skills of Loretta Lynn, the soothing yet stirring vocals of Patsy Cline, and the raw energy of Flatt & Scruggs. My next trip to the library included one of my first forays into the adult section where I found books on the history of country music. I still remember the surprised look on my dad’s face when he found me on the first floor, in the 700s. Fast forward a couple decades: I’ve served in the Marines where I had experiences that would lead to PTSD, my father died when I was 25 which triggered my first depressive episode, and through it all I struggled to stay sober, a battle I always lost back then when I was trying to do everything on my own. I’m now 50 years into this thing called life and I know beyond a doubt that reading has both enriched and saved my life. In my mid-20s, however, I popped anti-depressants and put my head to the grindstone. I had degrees to earn and tons of English and American Literature to read. I didn’t have time for my personal issues to get in the way. And that’s denial. It seems ridiculous to me now, but, like many people who experience a mental health challenge, my first reaction was denial. We resent that something is getting in the way, slowing us down from pursuing our goals, and maybe even derailing us completely. We should be able to just do it! We don’t want to admit that we have a problem and need help. We think we’re defective and, as much as Americans worship the cult of individuality, most of us don’t want to stick out in that way. The stigma against mental health challenges is alive and well, which is ridiculous because we all fall somewhere on the continuum when it comes to various markers of mental health. Books have always been a comfort to me and it was gradually being unable to read that forced me to confront my denial. During my masters program I found myself unable to comprehend what I was reading—not a paragraph, not a sentence, let alone an entire essay or book—and this forced me to admit I had a Big Problem. You can’t be a graduate student and not retain what you’re reading. I don’t remember how I got there, perhaps on a friend’s recommendation, but I ended up at the university counseling center. This appointment helped immensely, even if I was judgmental, skeptical, and resistant to the idea of psychological counseling. I took the prescribed antidepressants, which thankfully helped my reading problem, but skipped the recommended talk therapy. I had no tolerance for that back then and, besides, I was busy. A few years after that I was working on my PhD and had quit taking the antidepressants because my prescription expired and I had moved on to a new university in a different state. Besides, everything was under control. However, I remember this one day in particular where I felt like a caged animal pacing my office. I was once again in a depressive episode, in a bad relationship, and trying to read for a major exam. 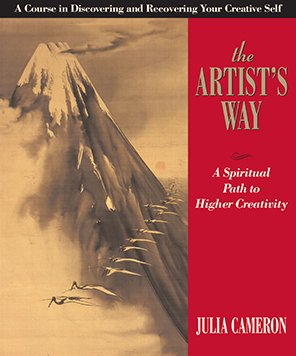 Thinking some pleasure reading would be a good diversion to calm my neves, I pulled my copy of Julia Cameron’s The Artists’s Way off the shelf, opened it to a random page, and read a line about crazymakers. I realized it described not only my current girlfriend, but myself as well. I shut the book, put it back on the shelf, and continued to struggle my way through life for a few more years. It wasn’t until I crashed and burned for the zillionth time in my 30s that I acknowledged to myself that my problems were real, not going away, and that I needed help. It was then that I took the time to start reading about the issues that therapists and other wise counselors were helping me through with. I crossed out the word ‘through’ because there is no neat and tidy ‘through’ to some fabled other side, but rather acceptance that we’re on a life-long path of taking care of ourselves. Self-help books get a bad-rap. There’s the stereotypical person whose life is a mess who reads self-help book after self-help book in an effort to get out of a rut. Or there’s the media icon who presents yet another book that’s going to serve as a cure-all. The truth is, self-help books may be one tool in what can potentially be a large and effective personal tool box. And like any repair or maintenance job, you have to know what you’re working on in order to have the right tools at hand. Reading another book on increasing your productivity or raising your self-esteem may pump you up for a short time, but if your underlining issue is trauma or addiction, it won’t help you deal with the monster in the room. And that’s where professional help comes in. Finding a good therapist is sometimes like finding a good book. Similar to flipping through novels at the bookstore, you might have to screen several therapists before finding one that clicks with you. And even if you’re 100 pages into a book, if something doesn’t feel right, it’s okay to DNF a therapist, too. Challenging yourself is good, but trust your gut if something doesn’t feel right or you feel like you’re just spinning your wheels. Above all else, to thine own self be true and continue to seek help. One of my favorite quotes is, “Life is not a struggle, its a wiggle.” It comes from one of my favorite self-help books, How to Heal Depression by Harold H. Bloomfield and Peter McWilliams. I love this book because it has helpful content and because its written in a bullet point format which is perfect for when you’re having problems focusing. Thanks for reading about my journey and thank you to BBI for highlighting mental health this month. I think it’s important to share our experiences so that others know they’re not alone. For me, it also helps keep denial from once again taking center stage. Thank you so much Chris for sharing with us.